Welcome aboard the North Atlantic Currents blog. Come explore the world with us from sustainable spearfishing at home in Denmark to coral gardening in Fiji and everywhere in between. Our trip to New Zealand so far has been mired in cool rain. Greeted in Auckland by the tail end of one storm, then on to the South Island as cyclone Gita hit. Heading down the West Coast travelling to the country’s more southern reaches would offer little respite. After all, the further South you go, the closer you get to Antarctica – and all the cool weather blowing off it. The West Coast of New Zealand is the wettest too, duh! Milford Sound and Mitre Peak, New Zealand. Now, donning our raincoats, we’ve headed to one of the only areas of New Zealand I’ve actually ever heard of before landing; Queenstown and Milford Sound. For those adrenaline junkies among us, you'd recognise Queenstown as the birth place of bungee jumping. And many of us would have glanced a beautiful photo in school of a spectacular New Zealand fjord with a massive mountain jutting out of it. That’s Milford Sound with the all-mighty Mitre Peak (1,692 meters) jutting out. As we began driving away from the cool, rugged mountainous beauty of the West Coast, the sky gave way to the splendor of the southern alps. Their azure lakes including Wanaka, Hawea and Wakatipu are true stunners. 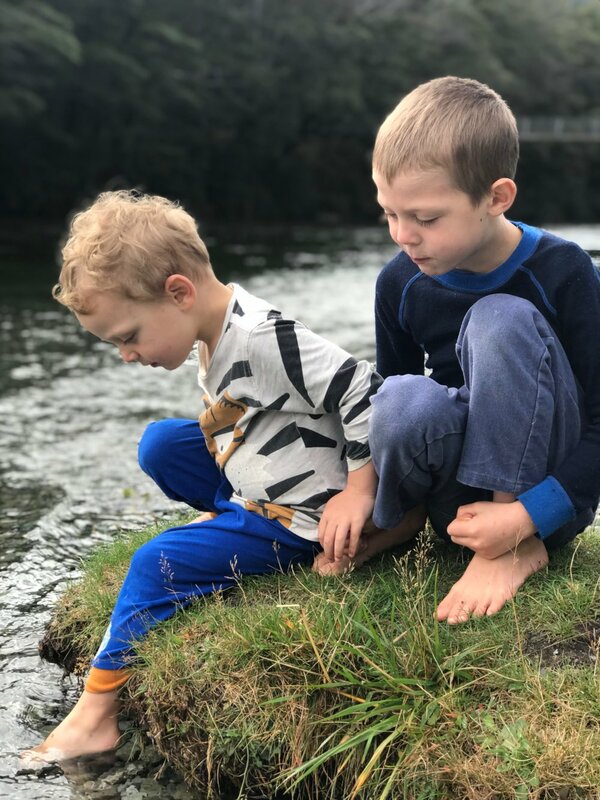 Sven would have been content to keep forging ahead toward Fiordland to keep enjoying the nature, but I insisted we pay homage to the town that invented hucking yourself off a bridge fastened to a giant rubberband. Our campsite on Lake Hawea. Queenstown is a lovely small action-sport town tucked along the towering Remarkable mountains at the shores of lake Wakatipu. They say the lake water is some of the world’s purest- 99 percent in fact. The clean fresh shore of Lake Wakatipu. Before venturing off from London, one of the places that kept getting recommended by friends was a burger joint, Fergburger, in Queenstown. So, naturally it'd have to be our first stop. What could we expect? A huge burger with anything you could imagine to add on top combined with a huge queue. The line greeter however assured us that we came at just the right time because it was only about a 40 minute wait, hmmmm. Well, we had to give it a try so we placated our appetites after ordering with a little jaunt around town. If you’re in the market for outdoor equipment and apparel rest assured Queenstown has no shortage of shops for you. The floor of the now infamous Ferburger, Queenstown. Upon returning to the restaurant we were not disappointed! Massive burgers filled with cheese, avocados, bacon, etc. great fries and friendly people behind the counter all combined to make it well worth the ridiculous wait. Then it was on to the skyline gondola to take us up for some spectacular views of the city. Soaking in the views from the top of the of the skyline gondola, Queenstown. Action adventures rule here, but with two kids in tow it was a bit difficult to get a sense of everything the town has to offer. On our gondola ride up we saw bungee jumpers, paragliders and mountain bikers. At the top, we opted for the family-friendly luging. A bit dinky compared to say sky-diving or white-water rafting, but fun none-the-less. Plus, Axel was exhilarated afterwards and said it was the best thing we’ve done so far. So much for helicopter rides! On the chairlift to the luge, Queenstown. After our brief stop in Queenstown nature called. While Queenstown and Milford Sound look just around the corner from each other on a map, there is actually no direct route. That is unless you go for a flight or boat ride. We wouldn't be leaving our camper van behind though, so instead we'd be driving to Te Anu in a near loop to get to the fabled Fiordland National Park. The park is home to Milford and Doubtful Sound plus a number New Zealand’s great walks including the Routeburn, Kepler and Milford tracks. Another time, when the kids are older, we will definitely be giving one of these a try. In the meantime, to get to all this natural splendour we'd be driving heaps. Mavora Lakes, or should I say Mirror Lakes. After much hemming and hawing, we decided to take a bit of a detour to Mavora lakes for a few nights of camping. Run by the Department of Conservation, there are a number of camping spots and huts (if you have 4-wheel-drive) to while away a few lazy days. For Lord of the Rings geeks, this spot played host to Nen Hithoel in the films, so naturally it is beautiful and well worth a stop. Samwise and Frodo on the set of Lord of the Rings, Nen Hithoel aka Mavora Lakes. 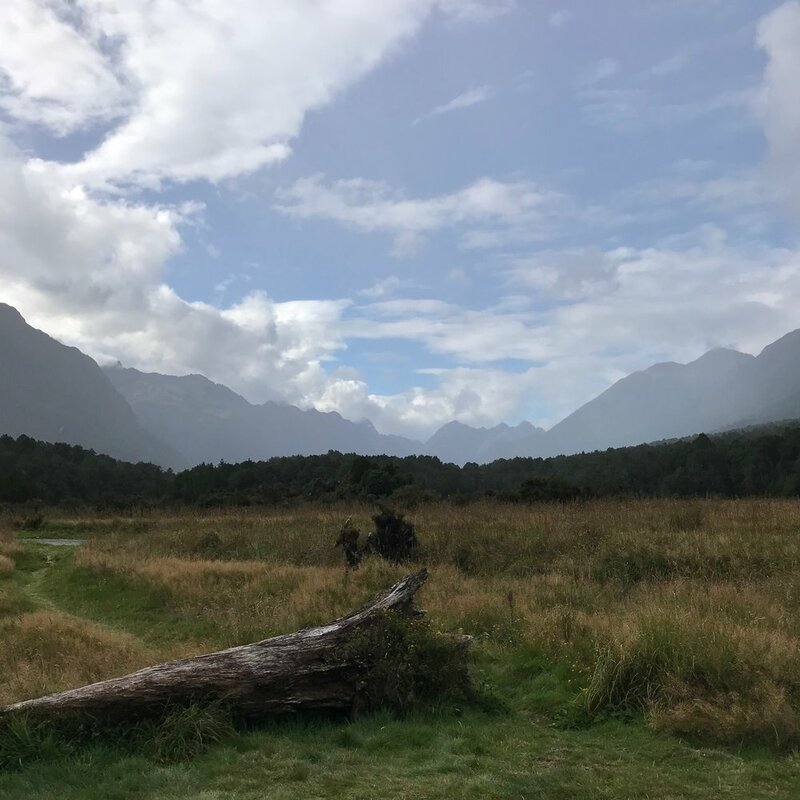 There are loads of spots to camp inside Fiordland National Park and the mountains are absolutely beautiful. We spent a peaceful night along a stream in a flat surrounded by snow-capped peaks. The drive down to Milford Sound next morning was a windy one. Twists and turns, rain and fog, plus a long mountain tunnel all combine to make you feel you’re heading toward the end of the earth. By the time we reached our boat cruise it was raining cats and dogs. Luckily, we were living by the Danish expression of dressing appropriately so were well covered, all the way down to our adult rain trousers. Deer Flat campsite, Fiordland National Park.